Other birds will often visit hummingbird feeders for the nectar contained within. They are usually much larger than hummingbirds and will scare them away from feeders. Hummingbird feeders can be popular with Orioles, Finches, Sparrows, Woodpeckers, Thrushes, Warblers, Titmice, Mockingbirds, Grackles, Warblers and Flickers. There are two choices to deal with other birds at hummingbird feeders. Let them use the feeders or use methods to deter them from the hummingbird feeders. Why would other birds visit hummingbird feeders? Some species of birds eat sweet fruit and fruit juice in the wild. So they don't mind the sweet nectar one bit. A few of these birds are large and aggressive. They tend to crowd out or scare the hummingbirds away. One common example would be a Blue Jay. Another is an Oriole with a particular liking for nectar. Even though we might enjoy these birds, we often don't want them at our hummingbird feeders. We get many letters from our visitors, wondering what to do. Some don't mind the other birds but still want hummingbirds. Others want hummingbirds exclusively. Hopefully, this advice will help. If an unexpected guest is not a problem, simply add more hummingbird feeders. This advice works better if you have a large yard and its easy to spread the feeders throughout your property. Everyone will be fed and happy. "I remember excitedly putting up my first bluebird houses several years ago only to find them occupied by swallows. Wish as I might, putting out a sign “Bluebirds Only” wouldn’t have worked! I enjoyed my beautiful Tree Swallows and put out more bluebird houses in a different location in an attempt to get my bluebirds. Eventually, I had both swallows and bluebirds. So nature will adapt and yet we can have our way." Hummingbird Feeders Attract Other Birds! 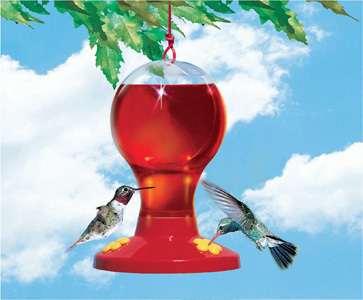 If an unexpected guest is not a problem, simply add more hummingbird feeders in different locations. Everyone will be well fed and happy. If you prefer to restrict the hummingbird feeders to hummingbirds, use feeders without perches. We do realize that this seems like a sacrifice for the hummingbirds who like to perch while feeding on the sweet nectar. Hummingbirds are like pets to us and we like to pamper our pets. Remember however, that hummingbirds are wild birds with special flight ability enabling them to hover in place effortlessly while eating. Frankly, we do not believe that they mind. Just watch them hover at flowers and you will agree. Hummingbirds are marvels in flight. Without a perch, a hummingbird feeder is useless to another bird besides a hummingbird. So they again will become masters of their feeders. Hummingbird feeders attract other birds such as woodpeckers. They can be heavy enough to tip over some feeders causing the nectar to spill out. They also drink a lot of nectar if they don't spill it first. A simple solution would be to put out a suet feeder for the woodpecker (flickers). Hopefully, this bird will be satisfied with this food source. A lot of people just put up with the woodpeckers and re-fill the feeders after the woodpecker is finished. Hummingbird feeders attract other birds, maybe you don't mind! Do You Want to Feed Other Birds at Hummingbird Feeders? Now you have two choices. Some give up feeding the other birds entirely in summer in favor of hummingbirds. Unfortunately, this can possibly add to the problem. If these other birds suddenly find a scarcity of food, they might visit the hummingbird feeders. Instead, you can choose to stop feeding these other birds year round. They will find food elsewhere. Another choice would be to be certain the other bird feeders are well supplied at all times. Sometimes this can be a matter of experimentation. All wild birds are different. Small birds such as finches and other species might visit a feeder occasionally. These birds usually are not a serious problem. They do not have the long tongues of the hummingbirds and are unable to access any nectar. Please take note that there are special nectar feeders made for orioles. 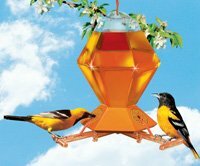 These oriole feeders are orange and are made to be a better fit for their beaks. If orioles are the birds using your hummingbird feeders, it would be better to purchase an oriole feeder for them. Tiny hummingbirds are indeed afraid of larger birds. Sometimes large birds crowd out the feeders because they feed in flocks. Yet, at times other birds do co-exist with hummingbirds. Orioles are one example of a bird that can take turns with hummingbirds at a feeder. So if you don't want to give up this beautiful bird and don't want to buy a feeder for them, you might just see what happens. There are other creatures who invade hummingbird feeder too. Ants eat hummingbird nectar in good quantity. Bees enjoy the sugary drink and scare hummingbirds away from feeders. Bats will empty a feeder overnight. Squirrels can destroy a feeder in their hungry quest. Bears as we know do love a sweet treat. Bears are active at night, bring your feeders in at night. Since Hummingbird Feeders Attract Other Birds............... Happy Bird Watching!